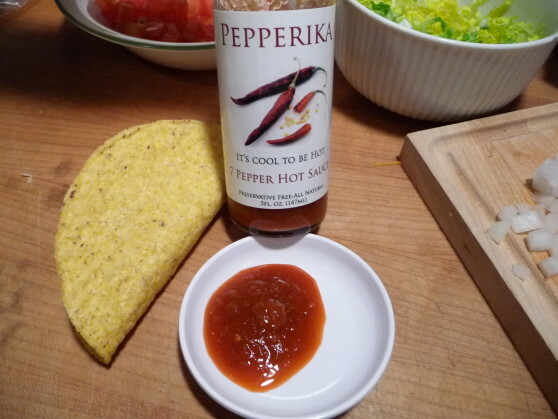 Pepperika 7 Pepper Hot Sauce is just what the name says: A hot sauce made from 7 different peppers and little else. The first smell is very tomato-ey (that’s a word because I say so), and doesn’t give much of a clue of the heat that resides within. I was a little skeptical at first, as it smelled like salsa, not a hot sauce which normally has at least some vinegar. The consistency is perfect. It doesn’t run off the food and has a nice thick texture, with bits of peppers and tomatoes throughout. It doesn’t separate easily, and when you shake it you have to be sure to tap the bottom of the bottle to keep it from gathering at the top before you open it. I’m sure most of you have experienced shaking a bottle of sauce, opening the top, and having the contents pop up in your face or all over the counter when you put the bottle down.